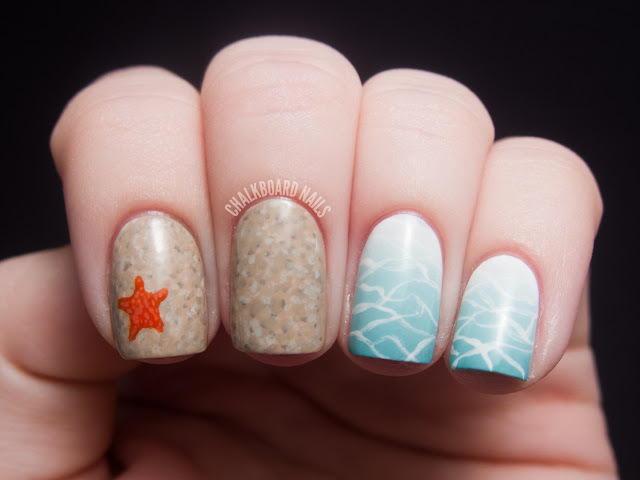 The competition calls for you to submit your best vacation nails, and when I think of vacation my mind automatically goes to the beach. It's freaking hot here in the middle of the desert, and on 110 degree days, I often dream of lounging on a beach. I really wanted to focus on the small details of a beach, though. I wanted to break it down and pay attention to some of the specific elements of a beach scene in a simple, abstracted way. My mind immediately went to the sunlit patterns you'd see on the ocean floor. I'm not sure how to describe them -- reflections? Distortions? I love that they are constantly changing and moving. I tried to replicate the look of clear Caribbean ocean water on my nails by first creating a gradient of China Glaze For Audrey and white. Then, using an It's So Easy Nails Stripe Rite in white, I freehanded the patterns over the top of it. On my accent nails, I wanted to try to convey the texture of sand. I started with a base of OPI Don't Pretzel My Buttons and then added dots of lighter and darker nudes over the top. The final accent on this manicure was a little coral colored starfish that I freehanded on using theBalm Orange You Glad You're Not Blue?. Of course, since this manicure is all about the details, I also added texture to the starfish's back. I'm so pleased with the way that this turned out. I love the idea of zooming in on some specific elements of a beach, so you really need to look at all the nails together to get the full picture. It's kind of like what all those fancy chefs do nowadays, right? Deconstructed food? This is a deconstructed beach! I completely LOVE this! You captured all the textures so well! 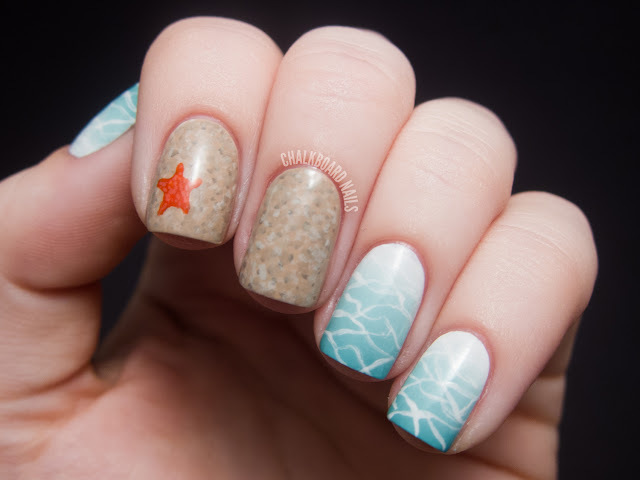 wow the texture for your "beachsand" nails are epic! OMG, so pretty! you really nailed all the details! awesome job! ATM it's raining here, what for a nice flashback to my beloved summer! Amazing nail art. 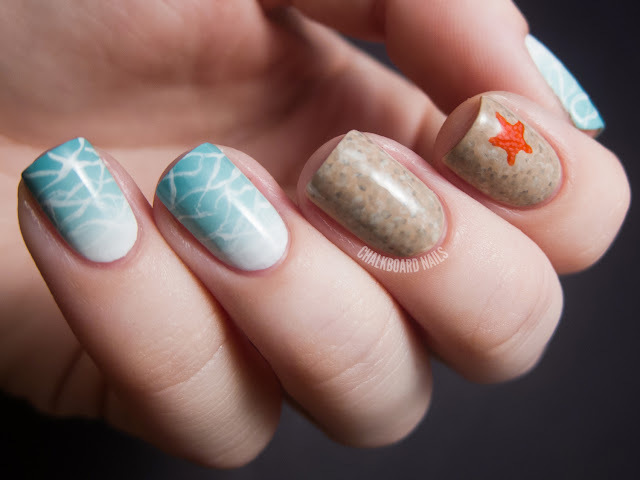 You really nailed the sand... and that little starfish is adorable! So pretty! and so clever! How can you do that? 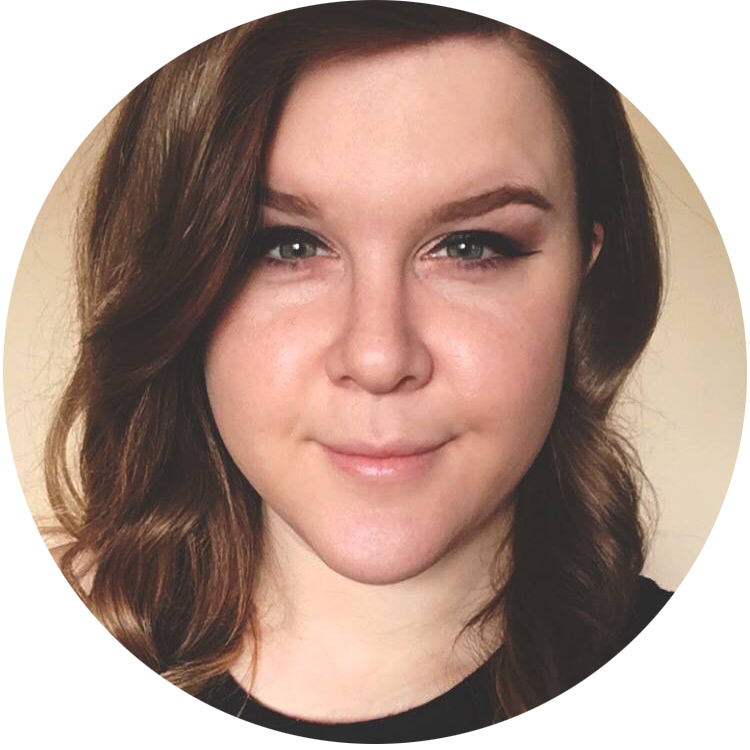 Every time I stare at one of your new designs, open mouthed and completely breathless, I know there's absolutely no way to astound me any better. Yet - you break my mental limits every time! I don't even know the english words to express what I feel when I see this mani so i'll use amazingly beautiful. But it is so much more then that! This is really gorgeous! Love it! Oh wow look at all that texture! These are sooooo beautiful! I really, really love these. The water reflection pattern is so perfect. Wow! This is absolutely stunning!! The sand look so real! I hope you win. OMG!! It's a amazing nail art! Congratulations!! OK, you are officially my nail polish HERO!!! OMG, this is soooo amazing!! Your sand is AMAZING! Wow! Wow! The "sand" is especially amazing. Wow this is stunning! Looks amazingly like real sand! I LOVE the water effect! This mani is freaking amazing! I wish I had half your talent! Just beautiful!! omg this is so cute, it's actually upsetting me.. LOL. Just did this myself. Not as good as yours but for a month into nail art, not too shabby!